Just how hot is Fintech? It’s scorching. 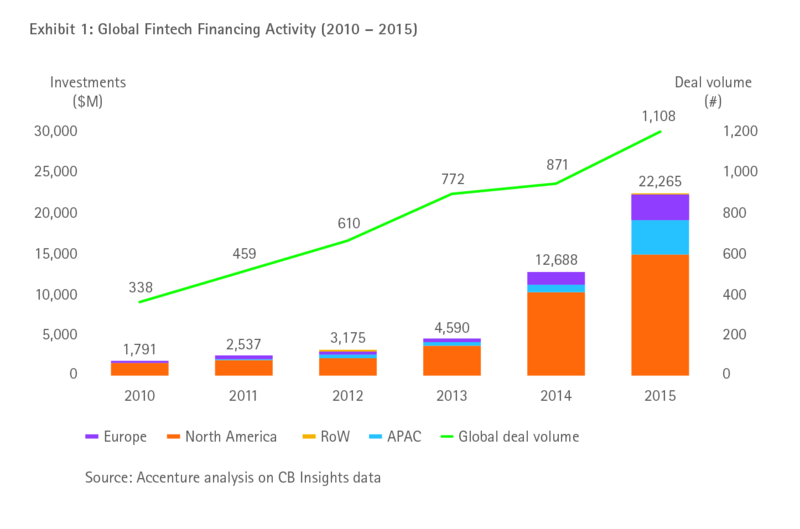 The total capital invested in Fintech startups rose from $1.8bn in 2010 to $22.3bn in 2015. This year should be even better as the first quarter brought another $5.3bn, a 67% increase year-over-year. The market is becoming more mature now, as the investment is shifting to the later stages of startup development and more VC leaves via acquisitions and IPOs. The trend makes cities like New York and especially London extremely important on the world's startup map. So far the US has dominated the investments, but European startups are gaining traction with London’s rising as the global Fintech capital. The role of the Asia-Pacific region has also increased recently. The rise of Fintech is the main point of concern for traditional financial companies. The biggest consulting firms have been providing them with analyses and recommendations on how to deal with new competitors. It's hard to believe, but the financial sector executives didn't quite see it coming. The authors of "The Future of Fintech and Banking" report still in 2010 no bank they spoke to during their Fintech Innovation Lab event in New York believed their corporations could be challenged by startups. They argued that sustainable banking services were too complex, too risky and too heavily regulated for new players to emerge. Today, banks and insurance companies are well aware of the challenge they are facing. They know that are unable to innovate at the pace set by the startup ecosystem, where hundreds companies perish for one company to succeed and get the jackpot. Traditional finance sectors need to act immediately. Trillions of dollars in revenue? "Absent any mitigating actions by banks, in five major retail banking businesses - consumer finance, mortgages, lending to small and medium-sized enterprises, retail payments and wealth management - from 10% to 40% of bank revenues (depending on the business) could be at risk by 2025", McKinsey analysts wrote in "Cutting through the Fintech noise". 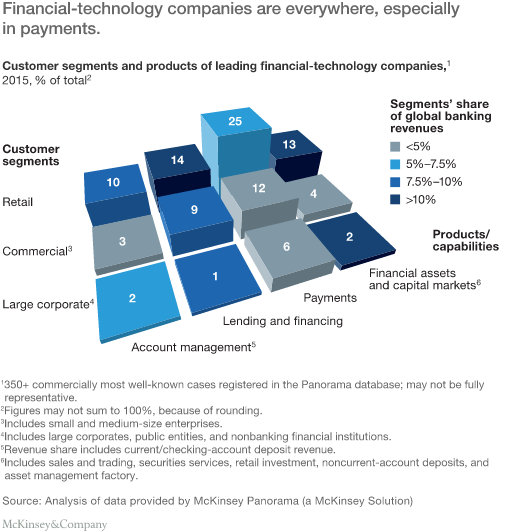 McKinsey tracks more than 2,000 startups who offer both traditional and innovative financial services. They estimate that the overall number of such businesses amounts to around 12,000. If you take a look at global banking revenues and profits broken down by activity, you will see that the stakes are high. 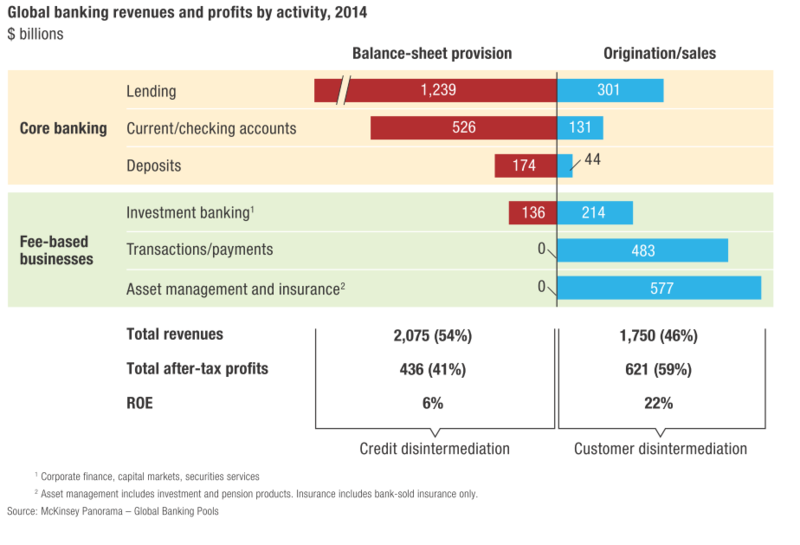 In 2014, global banking revenues from balance-sheet provision topped $2,075bn and revenues from sales and origination fees reached $1,750bn. Innovative methods of customer acquisition. Reduction of cost to serve – no physical distribution costs. New efficient uses of data. Data management and analysis hadn’t worked properly for years in traditional finance sectors, which was exposed by the 2008 credit crunch. Segment-specific offers. Starting with the most obvious at the beginning: millennials, small businesses and the underbanked. Leveraging existing infrastructure. Some of the most successful Fintech startups cooperate with banks and other traditional financial institutions. Managing risk and regulations. This is another post-crisis change that works on behalf of the startups. The push for stricter oversight, the challenges of data and privacy protection in digitalized finance have created room for more agile players. We can also group Fintech startups according to their attitude towards traditional financial companies. Some collaborate with their more traditional counterparts, others engage in direct competition. The graphs below show that the trends in the US and in Europe have been exactly opposite. 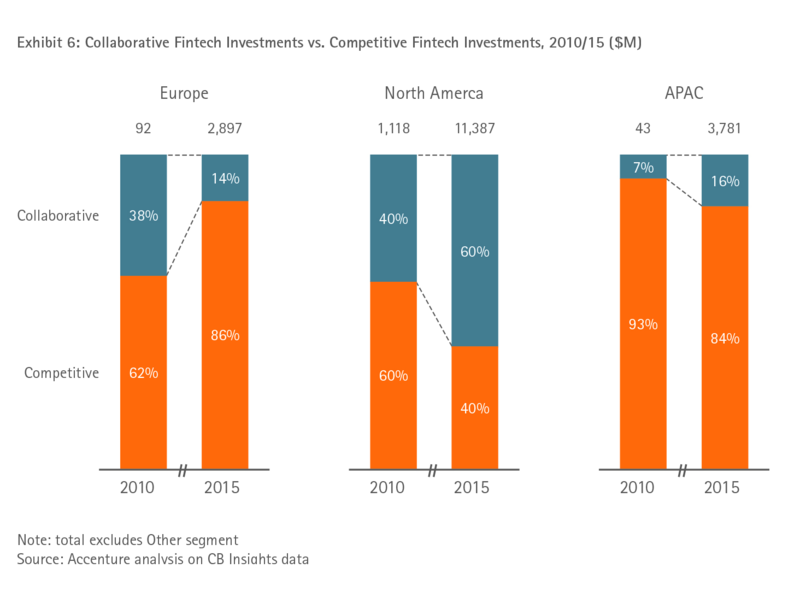 In 2015 in Europe, 86% of investments went to competitive Fintech (in comparison with only 62% in 2010). In the US, however, the figure dropped from 60% in 2010 to just 40% in 2015. What will be the future of Fintech? Accenture’s survey of senior industry executives draws two possible scenarios. The first scenario predicts that traditional finance will lose to the new players. Forced to meet strict regulations and cost reduction goals, they will be unable to compete with more agile startups. The banks will operate on the less profitable segments of finance and their brands will be relegated to suppliers of normal everyday utilities in the eyes of the customers, which will make them similar to water, energy and gas companies. In consequence, more exciting services and products will be provided by smaller disruptive companies. This is the scenario the most aggressive Fintech investors would love to see come true. The second scenario assumes banks will embrace the innovations at the business model level. They will use their resources (money and data) to predict future trends and tech users’ expectations. Eventually, they will come up with exciting new products and services. Traditional finance need to act as fast as possible, e.g. by building their own innovation labs. Deutsche Bank have recently unveiled their innovation lab in Silicon Valley. Here you can see a gallery of some innovation labs created by companies from the banking sector. It's hard not to notice that they begin where the startups usually finish: with fancy offices and recreation zones for engineers. That's not the type of environment that helped London startups from this list come up with their innovations. Is trying to build a creative tech-driven team inside of the most talent-drained area in the world a good idea? I don't think one can recreate a networked ecosystem inside a multinational corporation with any budget. They might want to try co-operating with smaller companies, acquiring already developed startups or employing remote development teams.